****DISCLAMER**** Stormy is my Arabian, not someone else's. If I describe another horse and looks exactly like yours or events were real it is just a coincidence. "Hey Ellis!" I yelled waving my arms around,running out of the ranch to Ellis' Property. "Mistyc is PREGNANT!" She dropped her shovel *nicely set it down so she doesn't spook Trigger, her horse* And looked at me. "With who?" She said in a questioning voice. "Bricket" I said. 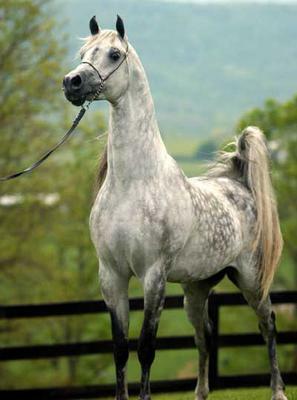 Bricket was a Silver Arabian stallion with a crescent moon on his forelock and a black sock on his 4th leg. "Taylor nuh uh" She sassed "Bricket? Really?" "Yup, Bricket Ol' Bricky Boy" I said. Dad came running over. "Mistyc is foaling! Hurry up!" he shouted. "ew" Ellis said while shivering in disgust and started walking over to our property. I followed her. When we got there Mistyc was nursing a grey Arab. Me and Ellis looked at each other with a smile on her face and she said, "how BEAUTIFUL! Whats its name?" I walked closer to it and saw his black pigmented muzzle. "stormy skies" I said, "ill name him stormy skies, stormy for short." I was up and on Stormy riding western for the first time. "Hows the saddle?" My trainer Nickie said. "You're doing good Taylor!" She said "Walk storm out now,Ellis get out the barrels"
"BRICKET" I said tying the reins to a fence. 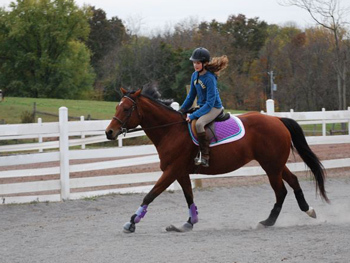 I grabbed the neared lead rope And clipped the lead to his halter. "Don't do that again Bricky," i said putting back into the hospitality paddock. I untied stormy and put him into his stall. I looked at the clock and yawned. I put feed and water in his stall and walked out to my property.